The earrings are 7 inches in length, having antique gold plated crown top and ear wire. 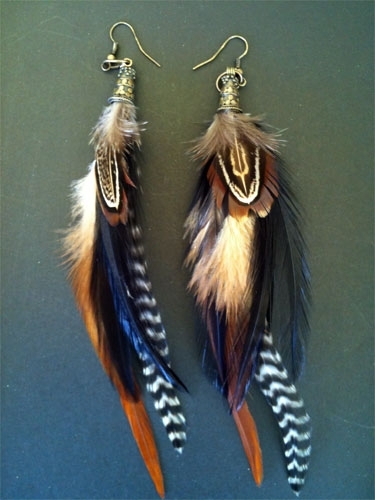 It features Brown, Black and Grizzly black & White feathers. It can be yours for just, $12.99 – you can purchase it from their website. If you are a Jewelry Artist, do get in touch with us at info@jewelstruck.com. Continuing with our “A Jewelry every day” series, featuring now very beautiful Apatite and Diamond ring in 14k gold. Designer Jewelesque thought to bring good tidings and riches to the wearer, Green Apatite also creates an eye-catching ring! Fashioned in 14K yellow gold, this ring showcases an exceptional 3.93 carat oval-shaped Green Apatite. A frame of shimmering round brilliant diamonds surrounds the gemstone and adorns the shank. Buffed to a brilliant shine, this .31 ct. diamond and green apatite ring is one she’ll turn to often. 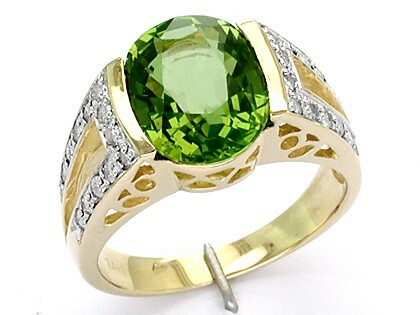 The ring can be yours for just $569. You can buy it from their online store on etsy. A Jewelry every day – Paraiba Tourmaline halo ring by Leon Mege Inc.